The year 1864 ended with Sherman's grand army in possession of Savannah, Georgia, following its infamous "March to the Sea" from Atlanta to the coast. The fall of Atlanta had virtually assured the re-election of U.S. President Abraham Lincoln that November, and the tide of war further shifted in favor of the Union. Ulysses S. Grant, general-in-chief of all Federal armies, now wanted Sherman's army to unite with the Army of the Potomac, under Grant's personal supervision in Virginia. Grant wanted Sherman's men ferried by sea to the Virginia fighting front, where the combined Federal forces might deal a fatal blow to Gen. Robert E. Lee's Army of Northern Virginia. The Confederacy's principal Eastern army, on the wane after four hard years of keeping the Federals at bay, was still in position between Grant and the Confederate capital at Richmond. As Sherman gained a lodgment in South Carolina, Fort Fisher fell to a Federal amphibious assault on January 15, 1865. This effectively closed the port of Wilmington, North Carolina—the hub of the last major supply route to Lee's army in Virginia. Wilmington itself would fall in February to the combined forces of Gen. Alfred H. Terry's Provisional Corps and Gen. John Schofield's XXIII Corps, hammering yet another nail into the coffin of the Confederacy. Grant's orders to Schofield specified that "Your movements are intended as co-operative with Sherman through the States of South and North Carolina. The first point to be attained is to secure Wilmington. Goldsborough will then be your objective point." Grant realized the importance of Goldsboro as the inland junction of the Wilmington & Weldon and Atlantic & North Carolina railroads. At least 425 miles of enemy territory lay between "Uncle Billy" and his ultimate destination in North Carolina, and a rendezvous there with Schofield and Terry. Sherman's army advanced on February 1, 1865, meeting little resistance as it marched northward. General P. G. T. Beauregard did in fact divide his Confederate forces to safeguard Charleston to the east, and Augusta, Georgia to the west. This unfortunate arrangement allowed Sherman's minions to pass through the heart of South Carolina virtually unopposed, cutting a wide swath of destruction as they advanced. With the city of Columbia and much of the South Carolina countryside in ruins, only North Carolina lay between Sherman's army and a junction with U. S. Grant's army in Virginia. To make matters worse for the Southern war effort, the Army of Tennessee and other Confederate forces in the Carolinas were widely scattered. With Robert E. Lee's army bogged down against Grant in the Siege of Petersburg, and Sherman's force swiftly approaching from the south, it was a dire time for the Confederacy. As general-in-chief of all Southern armies, Lee questioned General Beauregard's ability to oppose the Federals. As the Union juggernaut continued northward, Lee appealed to the Confederate War Department for a replacement, explaining that he knew of no officer who had so much "the confidence of the army and people" as Gen. Joseph E. Johnston. Lee's choice for the command was not a popular one with Confederate president Jefferson Davis, who deemed Joe Johnston a personal enemy. 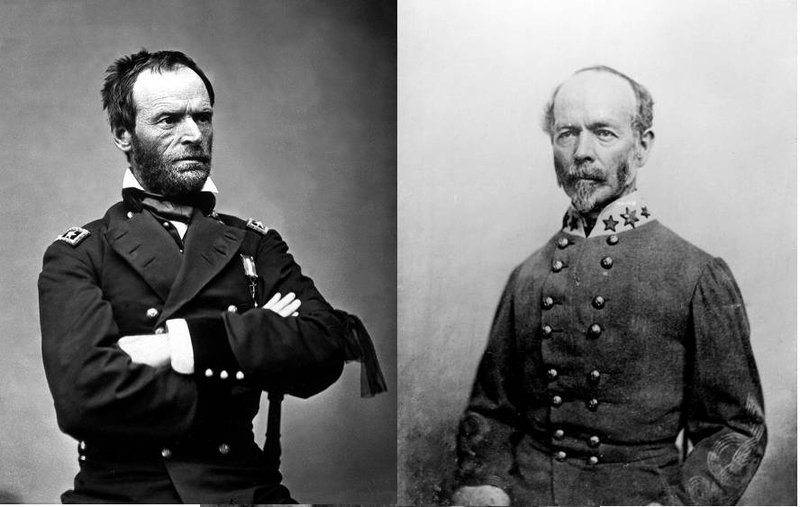 In one of the great personality clashes of the Civil War, the troubled relationship between Davis and Johnston came to a head in mid-July 1864, during the Atlanta Campaign. Furious with Johnston for retreating before Sherman in Georgia instead of engaging him in a decisive battle, Davis promptly removed "Old Joe" from command of the Army of Tennessee. But the Confederate president counted few options as Sherman approached North Carolina, and with Lee's earnest request Davis gave in and reluctantly allowed the general-in-chief to call upon Johnston for his services. Though he felt the effort to stop Sherman had come too late, a weary Johnston methodically set out to collect the scattered array of Confederate forces at his disposal. The troop concentration he would effect in North Carolina on short notice, and the resulting battle at Bentonville, would stand in sharp contrast to the general's earlier war record. Sources: North Carolina Office of Archives and History; Condensed from Moore, Mark A. Moore's Historical Guide to the Battle of Bentonville. Campbell, Cal. : Savas Publishing Company, 1997. Used with permission.